This article is about the NPCs. For the class, see Bandit (class). Bandits are aggressive NPCs. They are always hostile towards you and will attack you on sight, with the exception of Highwaymen. Bandits are regularly found in campsites, although they are also fond of inhabiting caves, as specified in Bandit Dungeons. The most common variety is identified simply as Bandit and is a blunt-weapon melee fighter of the Bandit class. The next most common variety is the Bandit Archer, a Bandit Archer-class NPC equipped with a bow. The least common bandit, the Bandit Hedge Wizard, a spell-casting bandit of the Bandit Wizard class. Hedge wizards generally only have a chance of appearing in bandit campsites, although there are nine locations in dungeons where hedge wizards appear. The Black Bow Bandits that are only found in a few locations near Leyawiin; see the Knights of the White Stallion quest for more information. The Bandit Ringleaders. Bandit bosses (with the Bandit Boss class), and are only found in dungeons. Eleven dungeons have a single Bandit Ringleader, typically as the final enemy you will encounter. One additional dungeon, Rockmilk Cave, contains two Black Bow Ringleaders. The Highwaymen, who are technically bandits, but behave a little differently by demanding gold rather than becoming hostile on sight. This behavior also carries over (in a limited fashion) to the more common Khajiit bandits. 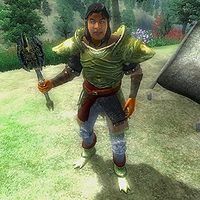 If you were to raise a Khajiit bandit's disposition (through Charm spells or Fortify Personality) high enough, he accosts you with the highwayman's demand of gold instead of the mundane conversations you'd otherwise get from bandits of other races. Unlike a highwayman, surrendering the 100 gold to the bandit will not satisfy him for long. As soon as his disposition returns to its original level, he will attack despite having accepted your gold. Male Khajiit bandits are not the only ones who will exhibit this behavior, as female Khajiit bandits will do the same thing. Despite the fact that there are no actual female highwaymen in the game, female Khajiit do have the voice file needed to conduct business as highwaymen under these circumstances. All bandits, including bandit bosses, highwaymen, and dogs, are members of the Bandit Faction, all with rank "Grunt" (although the faction has a "Boss" rank, none of the bosses have been given that rank). This faction ensures that they are allied with other creatures, but also ensures that they are bitter enemies of any Marauders. Black Bow Bandits and their ringleaders are also members of the Black Bow Faction. Bandits are also frequently accompanied by dogs, who may actually appear in place of a bandit. Most of the time when you encounter a bandit, the game only specifies that a randomly determined bandit-type enemy will appear in that location. In dungeons, such a bandit-type enemy has a 50% chance of being a melee Bandit, a 25% chance of being a Bandit Bowman, a 12.5% chance of being a Dog, and a 12.5% chance of being a nuisance animal. In bandit campsites, the chances for melee Bandits, Bandit Bowmen, and Dogs are the same, but the final possibility is a 12.5% chance of a Bandit Hedge Wizard. The following table summarizes the various types of bandits in the game. There are three general areas where bandits are found: many campsites are occupied by bandits; various caves, mines, Ayleid ruins and forts are occupied by bandits (see Bandit Dungeons for details), and there are 50 locations on roads where bandits can appear. * This item may possibly be enchanted. Bandits always carry light armor. Bandit Hedge Wizards have a large amount of magicka: they get +50 magicka from an NPC Mage birthsigns, plus their Breton bonus, giving them +100 maximum magicka. It is highly recommended that you use a silence spell or silence enchanted weapon against them to prevent the use of spell casting. Alteration: Burden on touch, Fire Shield, Frost Shield, Shield, or Shock Shield. Conjuration: Bound Weapon (Bound Axe or Bound Dagger) or Summon (Ghost, Scamp, Skeleton, or Zombie). Destruction: Damage Health, Drain Health, Fire Damage, Frost Damage, or Shock Damage (the damage spells may all be either on touch or on target). Illusion: Chameleon, Invisibility, or Silence on target. Restoration: Absorb Health on touch or Restore Health. Bandit Wizards were supposed to gain an additional +25 magicka from a custom birthsign. However, a bug prevents abilities granted from leveled spell lists from working. ? This page was last modified on 29 January 2019, at 21:44.